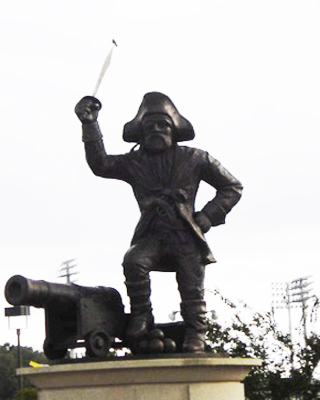 The statue of the East Carolina University mascot, PeeDee the Pirate, stands 13 feet tall and is constructed from three tons of cast bronze atop a concrete base. The pirate is dressed in typical swashbuckler attire, with a large tricorn hat, tall cuffed boots, and a pistol in his belt. He is depicted ready for action, with his right foot resting atop a mound of cannon balls and his right hand raised high brandishing his sword. A small cannon is placed on his right. The sculpture sits on a large semi-circular base that holds a bronze plaque with the inscription. Jakubowski, Glenda. “ECU Sculpture: Bronze Pirate Being Prepared for its Oct. 23 Homecoming Dedication,” The Daily Reflector (Greenville, NC), October 10, 1999. The monument was dedicated and unveiled on October 23, 1999 as part of East Carolina University's homecoming festivities. The name “PeeDee” comes from North Carolina’s long history with pirates. The Pee Dee River, running along the border between North Carolina and South Carolina, was a popular encampment for the pirates of the area. 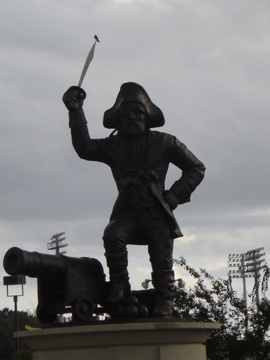 The mascot's appearance is based on the most well-known 18th century pirate of the region, Edward “Blackbeard” Teach. The statue was a gift from Belk Department Store magnate Irwin Belk, a statewide supporter of college athletics. According to the ECU Pirates website, the name for the mascot came from a naming contest in the local Pitt County schools. According to the website of the ECU Pirates, in 1985 ECU's chancellor shortened the mascot's name to simply "The Pirate" after complaints from the student body that they had no input in selecting the name. The monument is located in a brick courtyard outside the west end of the ECU stadium between the Murphy Center to the north and the Scales Field House to the south. The monument sits in a brick courtyard. A small lawn area and plantings are adjacent to the courtyard.